Next week I'm embarking on a big adventure- I am part of a group of amazing artists who are visiting sucy en brie-outside of paris- a sister city of Scituate ma. We will be staying with artist hosts there and painting every day, as well as sightseeing, eating and exploring. I will hopefully be able to post from there. 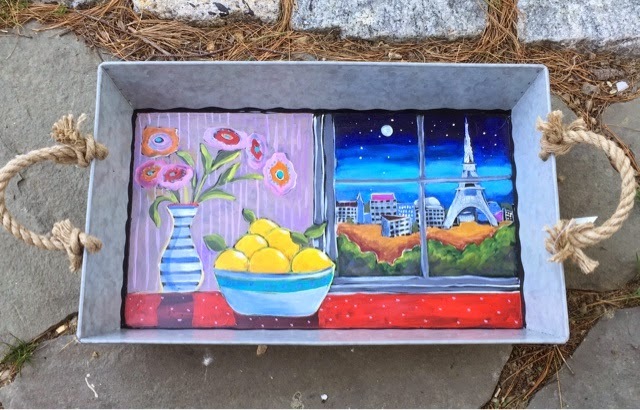 This is a tray I painted for the upcoming north river arts festival next weekend- first festival I'll be missing in 27 years! This will be with other artist painted trays and buckets and all for sale.